I can't believe this is the D-Day and time for the big reveal! Je n'arrive pas à croire que c'est déjà le jour J et qu'il est temps de dévoiler les pièces ! Week 1 "Project Bedroom & Closet"
Week 2 "Bedroom & Closet Plan"
Week 3 "Back to Black"
Week 4 "Crazy Last Minute Changes"
Week 5 "A Wonder of a Wallpaper"
When I took part in this ORC I didn't really have any plans for my bedroom and closet but the most important thing was to organise the things around here. 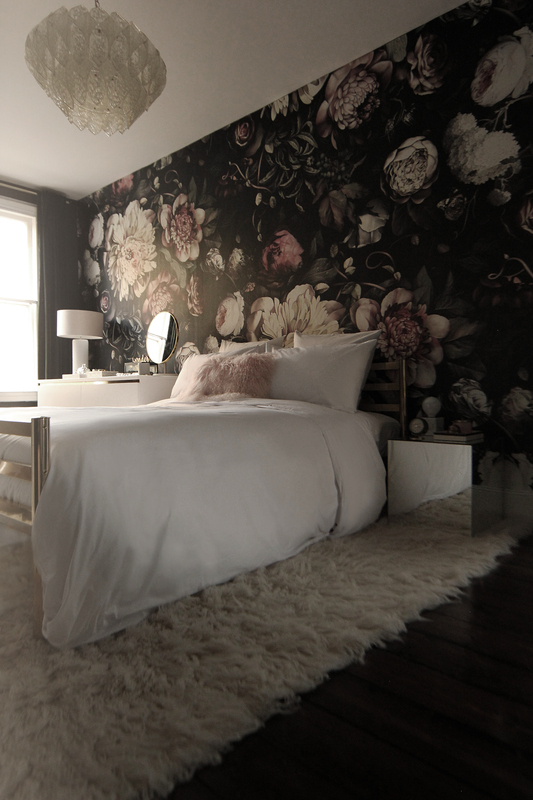 I wanted something dark and moody since I was obsessed with Ellie Cashman's Dark Floral wallpaper. As I already said, it was a crazy challenge with a crazy last minute change in the plan and unfortunately the rooms are not complete yet. I didn't have the time to finish some DIY projects, no time (and budget) for the closet wallpaper, I still have a few things to hang on the wall and some decorative items to buy. I would say that it's 80% complete and I am still proud of what I did so far. And this is part of the game, the challenge is over now so it was time to shoot the pictures and share with you the reveal. Here are a few before pictures so you can remember how it started a few weeks ago. Quand j'ai commencé cet ORC je n'avais pas de plan précis pour la chambre et le dressing mais la chose la plus importante était d'organiser les lieux. Je voulais créer une ambiance sombre car j'étais obsédée par le papier peint Dark Floral d'Ellie Cashman. Comme je l'ai déjà dit, c'était un défi fou avec un changement fou de plan à la dernière minute et malheureusement les pièces ne sont toujours pas terminées. 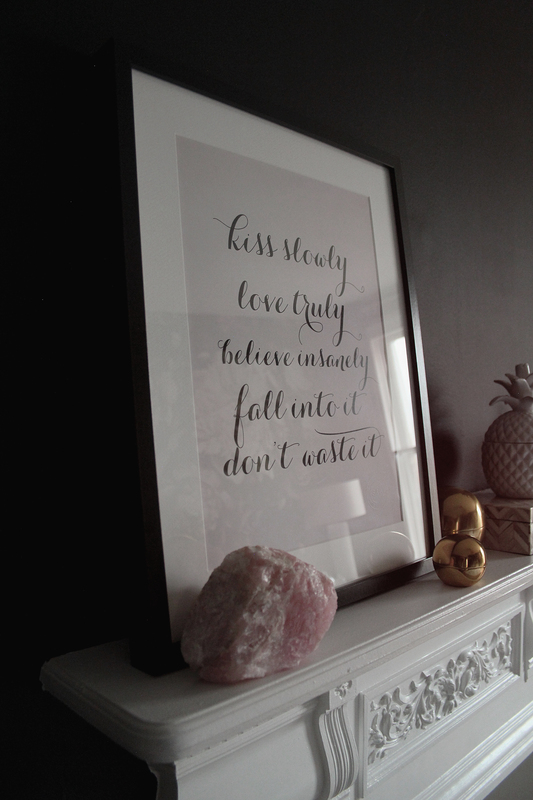 Je n'ai pas eu le temps de finir certains de mes DIY, je n'ai pas eu le temps (et l'argent) pour le papier peint du dressing, j'ai encore des choses à accrocher aux murs et quelques objets de déco à acheter. Je dirais que c'est terminé à 80% et je suis fière de ce que j'ai pu accomplir jusqu'ici. Et cela fait partie du jeu, le défi est maintenant terminé, il était donc temps de prendre les photos et vous dévoiler la transformation. Voici quelques photos d'avant afin que vous puissiez vous souvenir comment tout a commencé il y a quelques semaines auparavant. 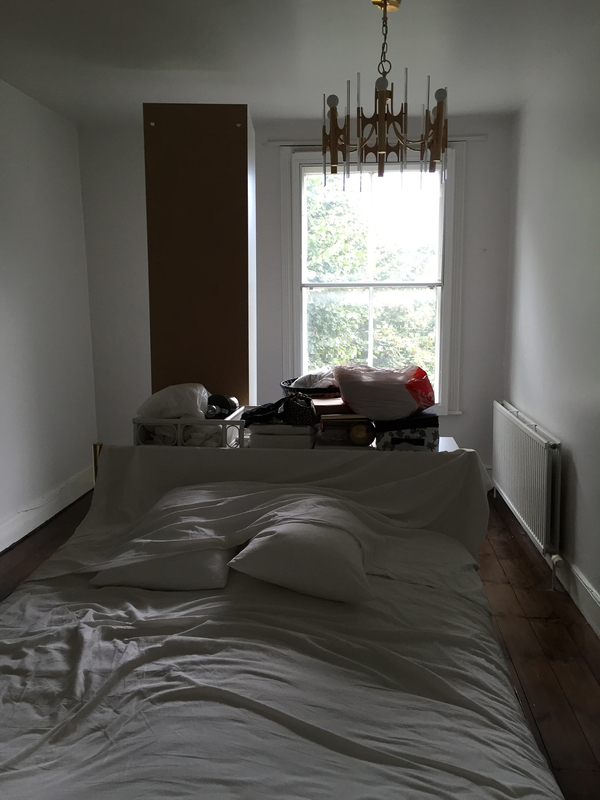 And here is the bedroom today. This is my wonderland and I love it! Et voici la chambre aujourd'hui. C'est mon pays des merveilles et je l'adore ! I am so happy I finally decided to go for that wonderful wallpaper! It literally makes the room. Je suis contente d'avoir finalement décidé de prendre ce merveilleux papier peint ! C'est l'élément phare de la pièce. I bought this gorgeous dark green velvet fabric to make curtains. The shade is similar to the leaves on the wallpaper and it is so soft and thick, perfect for winter. And if you noticed, between the chest of drawers and the curtains there should be a ugly radiator. But it's completely invisible thanks to the DIY I showed last week! J'ai acheté ce superbe tissu en velours vert foncé pour en faire des rideaux. Le ton est semblable à celui des feuilles du papier peint et il est si doux et épais, parfait pour l'hiver. Et si vous avez remarqué, entre la commode et les rideaux il devrait y avoir un radiateur assez laid. Mais il est totalement invisible grâce au DIY que je vous ai montré la semaine dernière ! 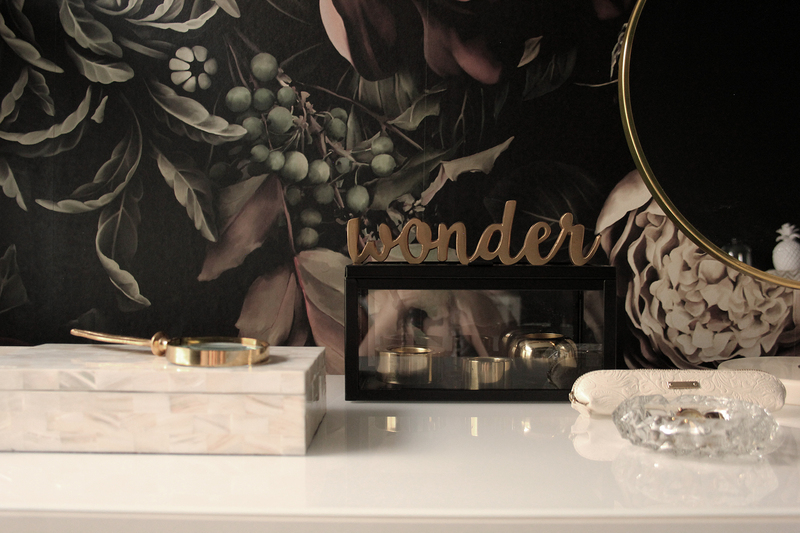 I was planning to put a round large mirror above the chest of drawers but now that I have this beautiful wallpaper I didn't want to hide it or ruin it with holes. 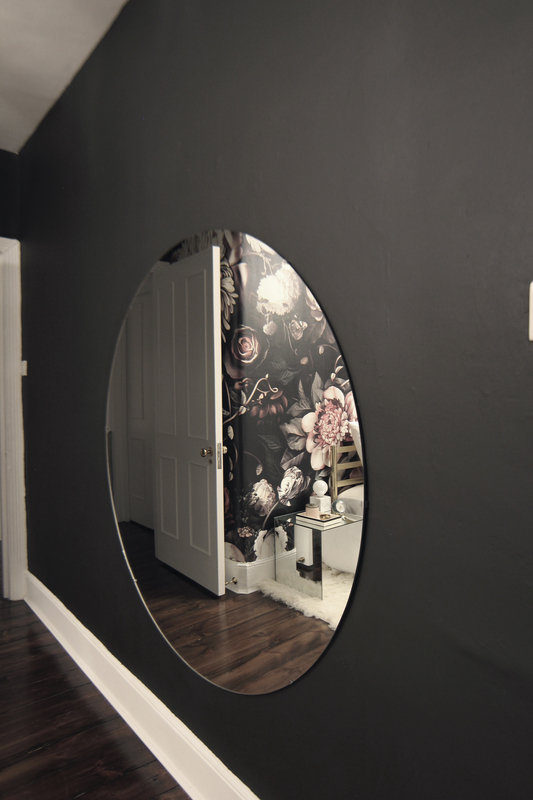 So I decided to hang my old oversized round mirror on another wall instead. J'avais prévu de mettre un grand miroir rond au-dessus de la commode mais maintenant que j'ai ce beau papier peint je ne voulais pas le cacher ou l'abîmer avec des trous. Alors à la place j'ai décidé de mettre mon ancien très grand miroir rond sur un autre mur. Here is my home office space. 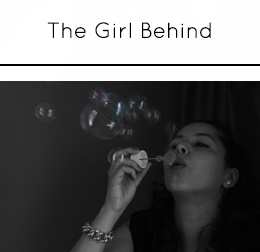 So glad I finally have a comfortable space to work on the blog. Voici mon espace bureau. Ravie d'avoir enfin un espace de travail confortable pour travailler sur le blog. Love the white fireplace with the white walls! J'aime la cheminée blanche avec les murs noirs ! 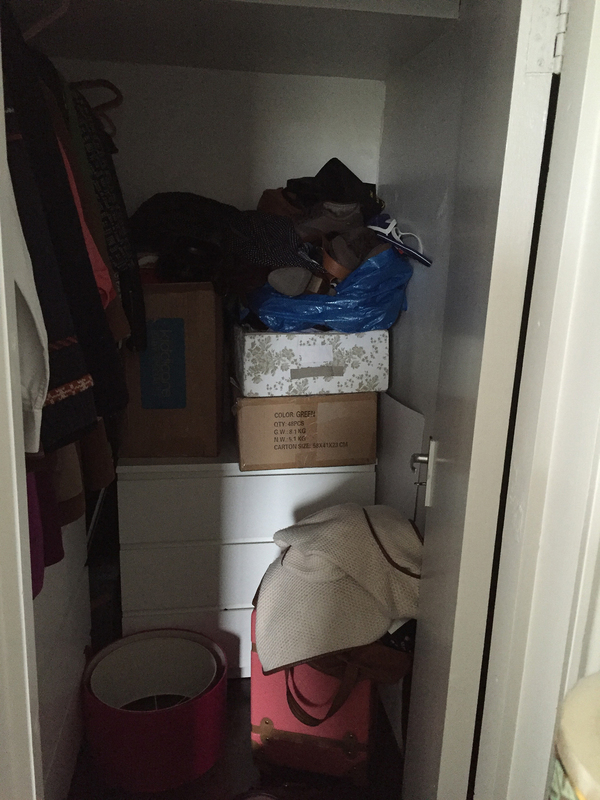 And finally the closet. It's definitely not complete but at least now everything is organised! No more mess everywhere, boxes and big bags full of anything. 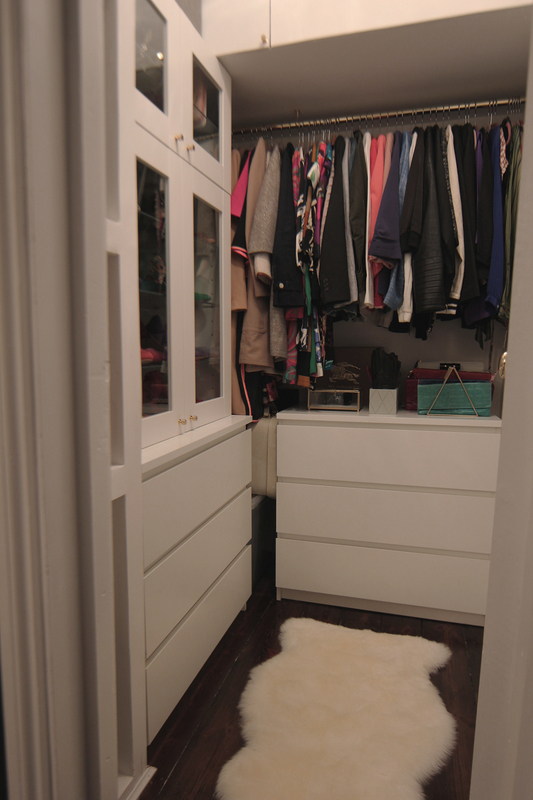 A clean closet with storage space for everything. Et enfin le dressing. Il n'est pas du tout fini mais au moins maintenant tout est organisé ! Plus de désordre, de cartons et de grand sacs rempli de tout et rien. Un placard propre avec des rangements pour chaque chose. All my shoes fit in those Ikea kitchen cabinets. Toutes mes chaussures tiennent dans ces meubles de cuisine Ikea. 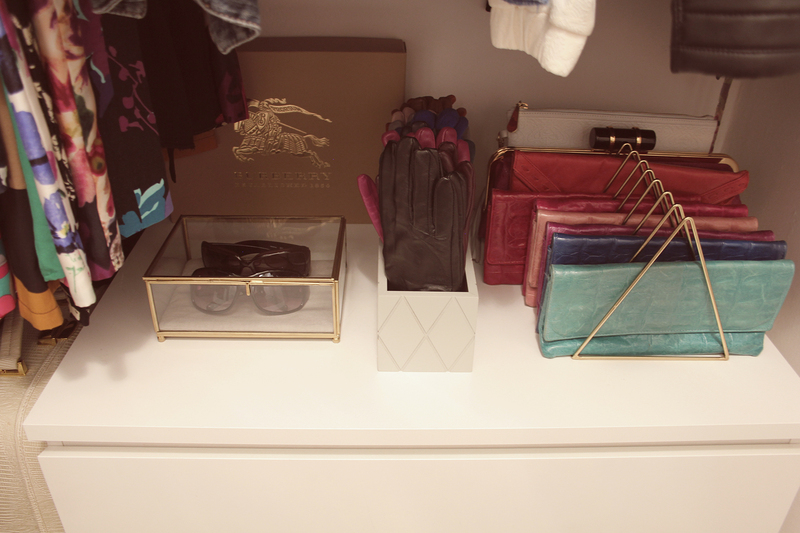 And even have a space for some clutches, my leather gloves and other accessories. Et j'ai même un espace pour quelques pochettes, mes gants en cuir et autres accessoires. So that's it! I finally have a lovely room and can wake up every morning surrounded with flowers instead of mess! And this is the reason why I love the ORC because I think that without that I would have never found the time and motivation to do this room. So thank you so much Linda for making all this happen! As I said, there are still a few things to complete the rooms so I will obviously keep you updated and share with you all my other DIY soon! 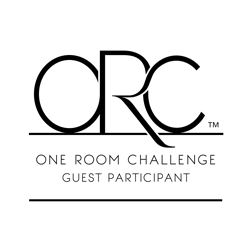 In the meantime, you should definitely have a look at all the reveals of those amazing ORC makeover and ORC Guest Participants. 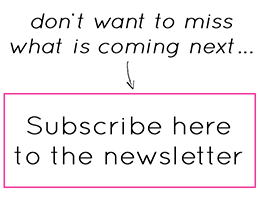 I am sure you will love it and it will inspire you for your own projects! Et voilà ! J'ai enfin une jolie chambre et je me réveille chaque matin entourée de fleurs et non plus de désordre ! Et c'est la raison pour laquelle j'aime l'ORC car je pense que sans ça je n'aurais jamais trouvé le temps et la motivation de faire cette pièce. Alors un grand merci à Linda pour rendre tout cela possible ! Comme je l'ai dit, il y a encore pas mal de petites choses à faire ici pour terminer les pièces alors je partagerai bien entendu tout ça avec vous, ainsi que mes DIY, très bientôt ! En attendant, vous devriez vraiment aller jeter un oeil à toutes les incroyables transformations de pièces de l'ORC et de l'ORC Guest Participants. je suis certaine que vous allez aimer et que cela vous inspirera pour vos propres projets ! 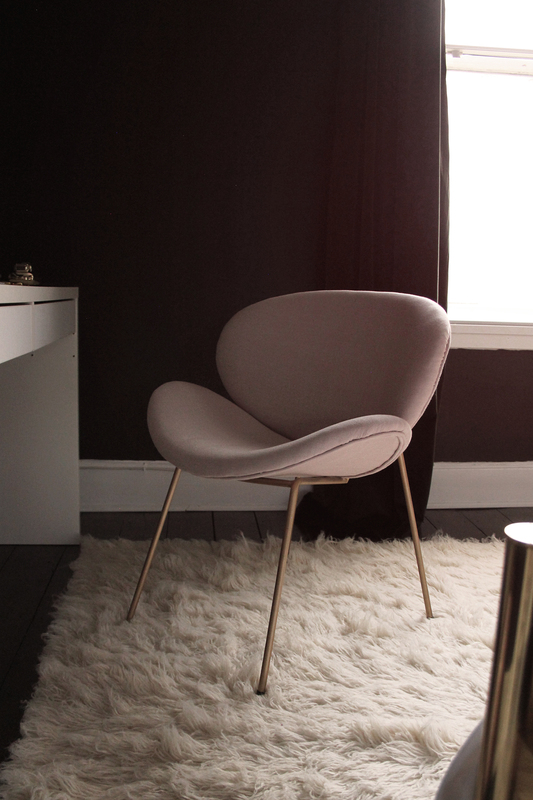 55 Responses to "One Room Challenge : Week Six « Bedroom & Closet The Reveal »"
I LOVE the color, texture and softness of the room! It’s beautiful!! You did an awesome job! Thank you so much Karrie!!! happy that you like it! I also love what you did in your office! 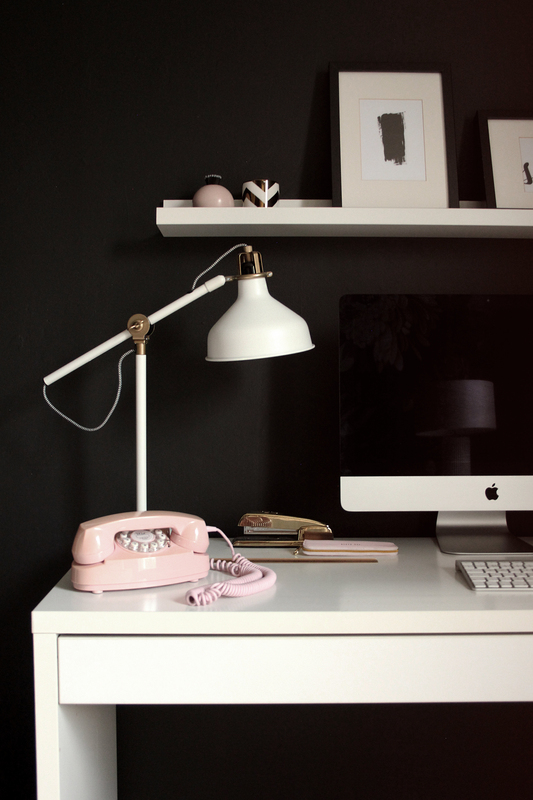 Lately I am addict to dark colours :) And that mustard chair on that dark wall is just perfection! C’est superbe, vraiment superbe. Cela doit être bien agréable de s’endormir dans une chambre pareille. J’espère qu’on n’attendra pas le prochain challenge pour avoir d’autres posts, toujours intéressants ! Merci beaucoup Véronique! Effectivement très agréable de s’y endormir et encore plus de s’y réveiller ! What a fabulous transformation. The wallpaper is really the star of the show, but I love the flokati, the furniture and that chandelier… divine. Thank you Sueli! 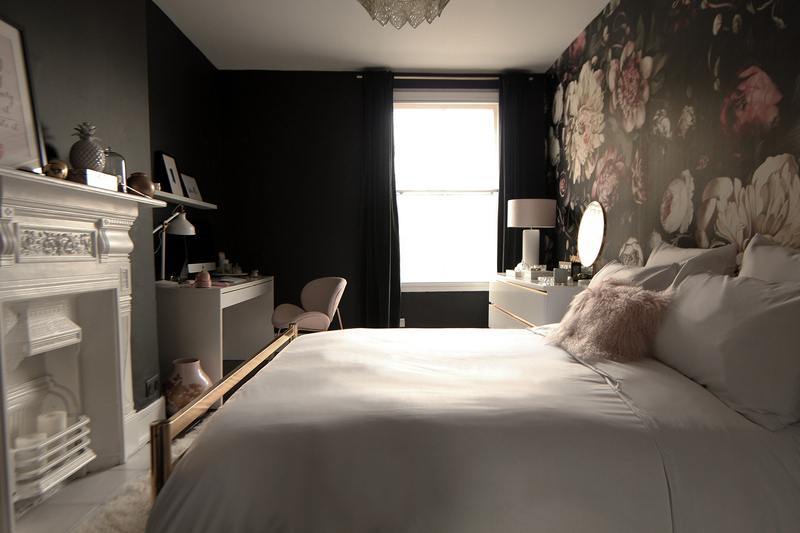 Yes the Dark Floral wallpaper is the star and totally makes the room! The bedroom would be completely different without it and even a little boring maybe. Well, it doesn’t look unfinished at all! 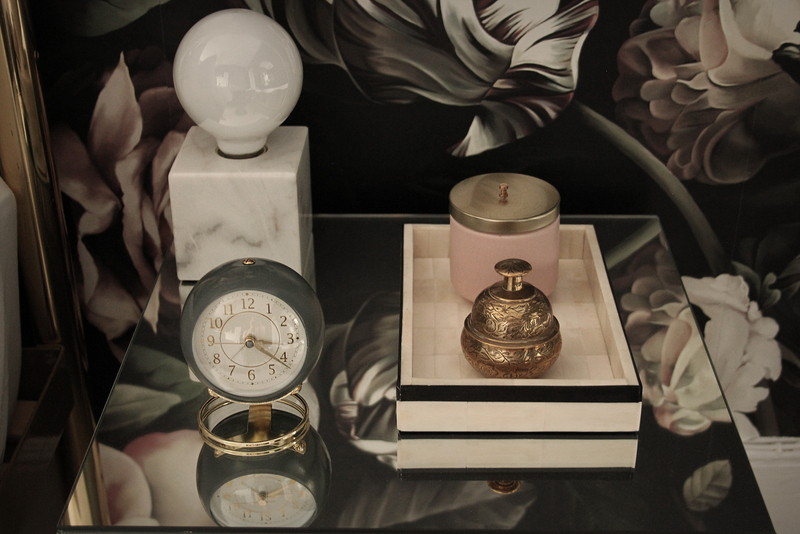 It’s a gorgeous space – so cosy and luxe. That wallpaper is everything! The wallpaper definitely makes the room and worth every penny! Beautifully done! It is simply gorgeous! Well done. Nadia, c’est absolument magnifique! 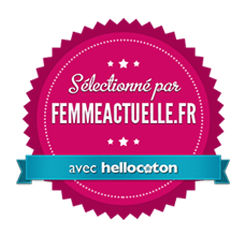 Félicitations. Comme il doit être bon de se réveiller dans cette belle chambre. Cette chambre c’est mon pays des merveilles ! S’y réveiller aide tout de suite à bien commencer la journée ! I woke up last night to link up really quick, but before I dragged myself back to bed, I saw your post. Because I was half asleep, I can’t remember if I commented already or not…but this room is the bomb dot com! Happy that you like it. 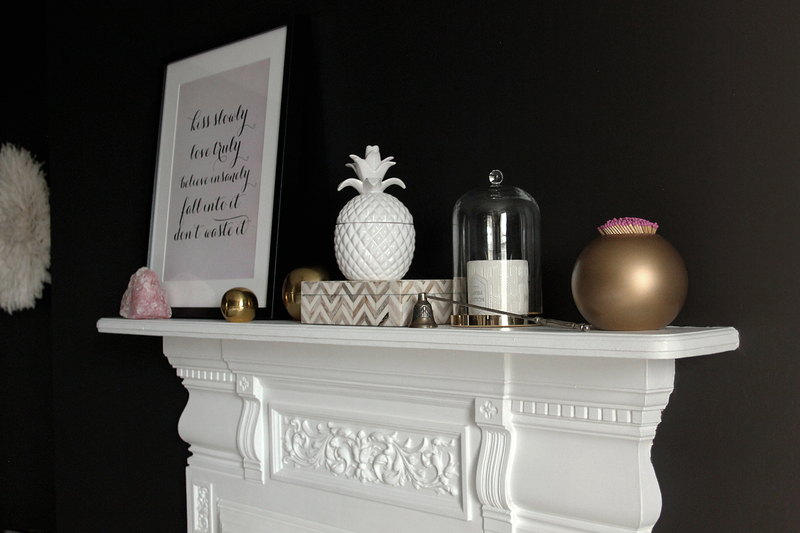 I think we have the same decor taste darling as I am totally in love with your makeover! That wallpaper, the cement tiles… Just gorgeous! I love your beautiful romantic bedroom! The contrast with the white is amazing and the wallpaper is fabulous! Just Gorgeous Glam! Tell me, what white paint did you use? It’s sooo white! And to answer to your question, the white paint is just the basical wall and ceiling Dulux paint. I think it looks so white because of the contrast with the black walls. this bedroom is a dream! wow! i love the mix- it’s all so modern and romantic at the same time. and that wall. WOW. Thanks Cassie! When I read a WOW in a comment it already makes my day but 2 wow really makes me WOW!!! This is absolutely gorgeous and simply glamorous!! What a beautiful transformation!!! Excellent job! Thank you so much Jen! Anyway, so glad you like it! 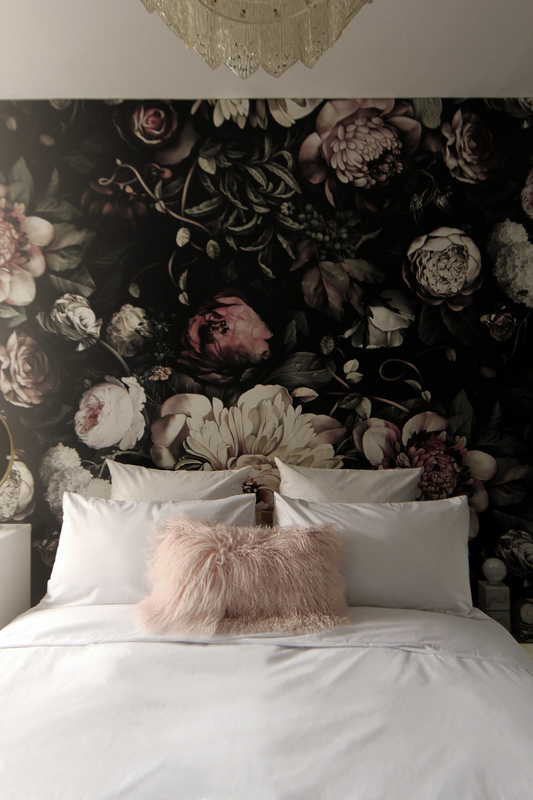 Such a beautiful, feminine, cozy bedroom! Fabulous job!! Thanks Lauren :) Glad you like the bedroom! Your ORC stopped me in my tracks! Just had to let you know. 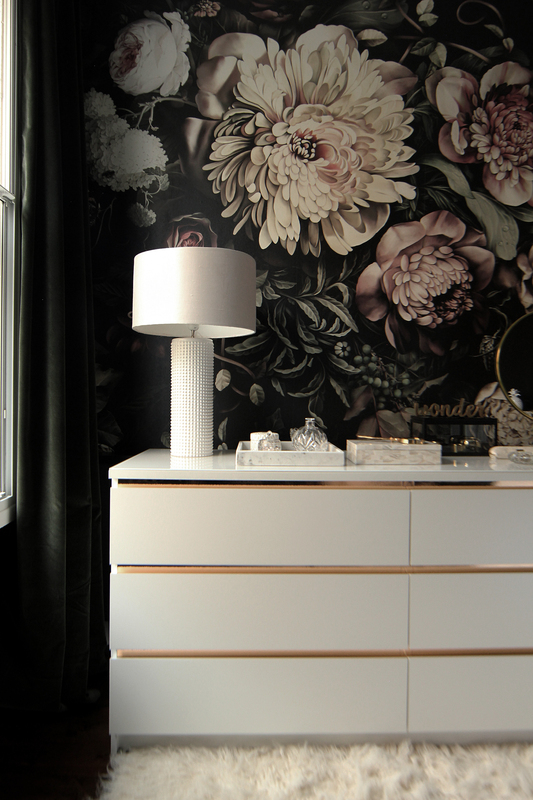 That wallpaper mixed with that white dresser with the gold and that rug. All of it is just perfection! This is GOOD! I love how you did not just put the wallpaper up and stop. I like that you accented it with black and created « the setting » in color, texture, and finishes. Love it! Thanks Jessica!!! So glad you love it! Anyway, thanks for inspiring me! Oh my goodness! 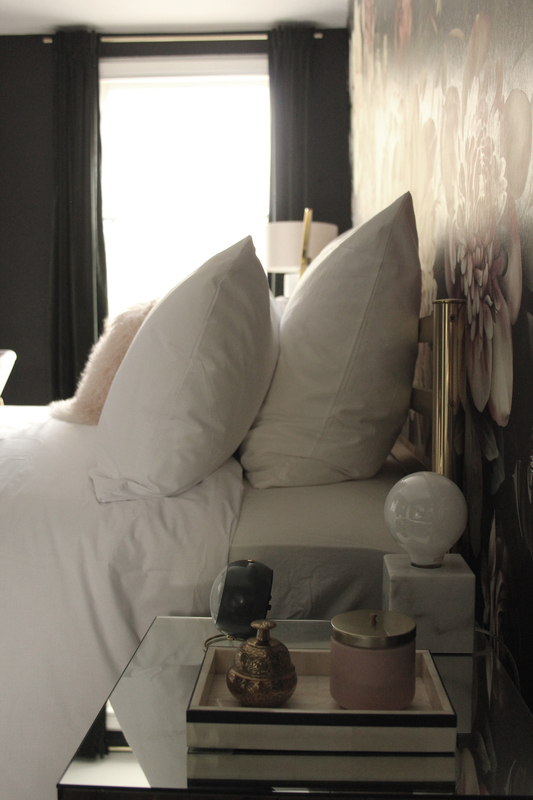 I am so wildly obsessed with your room and your style! Absolutely stunning! 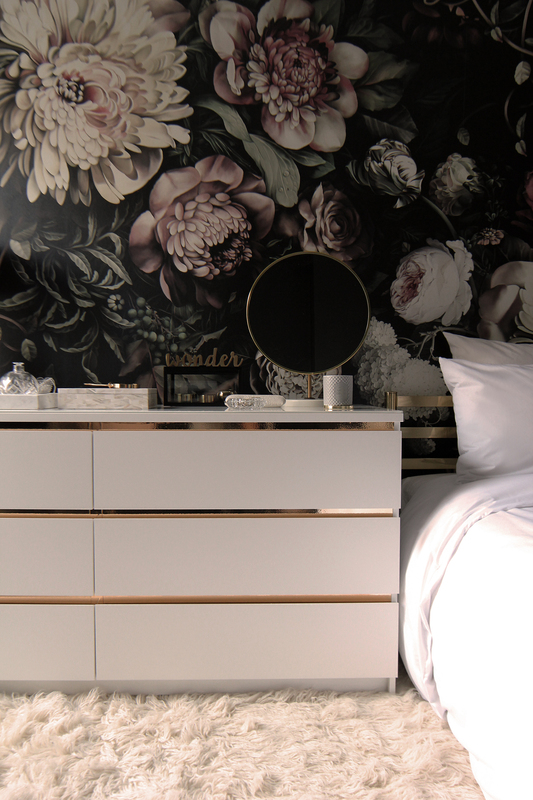 I also have a brass bed frame, and my dresser is a mod vintage piece that is white with gold/brass trim! That light fixture is what dreams are made of! So many nice words in one comment!!! You just made me blush! The light fixture is a vintage ebay find, a real bargain but it took me 2 days to clean it!!! Now it looks like new and it’s so beautiful! Thank you so much Oksana!!! It’s so nice of you :) And by the way you really should go for that wallpaper! Glamorous is all I can say , love it !!!! That wallpaper is everything! And I love all the texture in the room too. 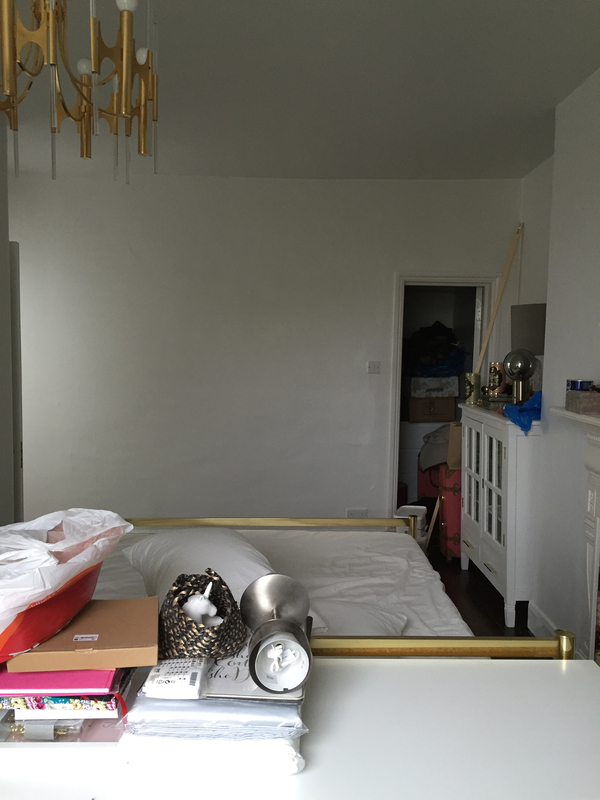 How did you do the IKEA malm DIY hack with the gold between the drawers? The room is absolutely lovely, you did a great job and the 6 week challenge is definitely inspiring! Happy you found the DIY for the dresser and glad you like the room! You did an amazing job! I love that wallpaper so much! Thank you for sharing your space. What a gorgeous makeover! So inspiring! Congrats!!! The room is just so cozy and feminine. So glad you like the bedroom! And yes, that wallpaper is everything!!! Trop gentil de me tenir informée en tout cas !!! Thank you so much Heather for all those sweet words!!! I just can’t tell enough how it makes my day when I read such amazingly nice things! I absolutely love this room – it is so beautiful. 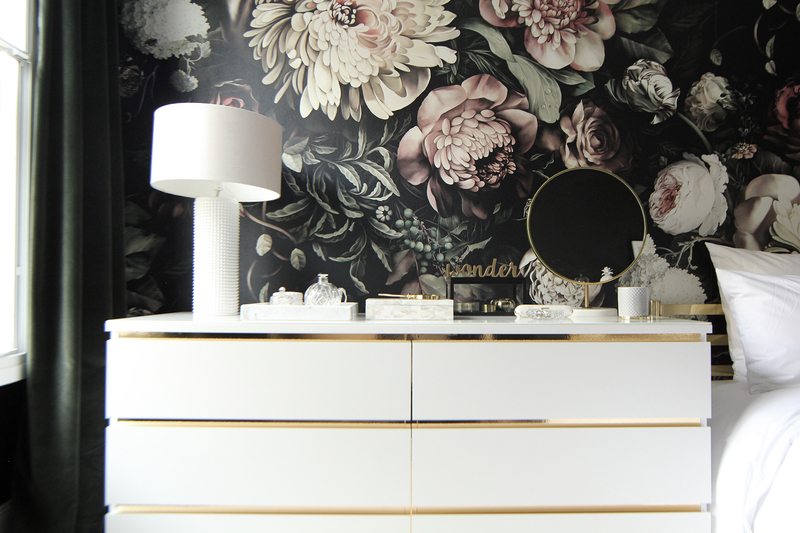 Which of the Ellie Cashman wallpapers is this please? 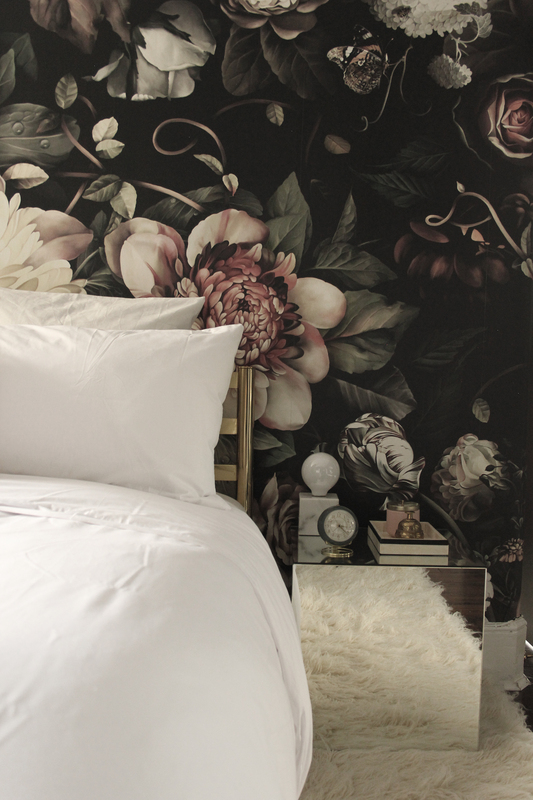 I think it might be Dark Floral II Black Saturated XL (200%) Wallpaper but I just want to check before I buy some myself. Thanks for your help. The Ellie Cashman walllpaper I used is the Dark Floral II Black Saturated XL and believe me it’s even more beautiful in real!!! Have a wonderful floral day!